Our Community - Sheila Schmeling - "Providing for pets in paradise"
The population of Ambergris Caye has grown tremendously over the past ten years with the increase in tourism and the marketing of our paradise. Many people who have come to the island, whether from other countries to work or just for vacation, return again to stay. With them, come their families as well as their pets. Another growing population is the animals that are left to roam the streets and add to the number of animals needing care. This week, The San Pedro Sun is pleased to feature a person who came to the rescue of our community and its demand for veterinary care, Dr. Sheila Schmeling. Sheila Schmeling was born in Brookings, South Dakota the daughter of a career Air Force father, Lyle Schmeling and his wife Delores. Throughout her young life, Sheila and her four brothers and sisters lived in at least 14 different locations throughout the United States as well as in Wurtzburg, Germany for a time. In high school, Sheila's main interest was science so she joined a variety of clubs and spent a lot of time backpacking with fellow students. Graduating from Cabrillo High (California) in 1967, Sheila continued her education at the University of Massachusetts, leaving there in 1971 with a Bachelor's Degree in Animal Science. For the next six years, she studied at Colorado State University (CSU), where she received a Master's of Science Degree in Animal Nutrition and became a Doctor of Veterinary Medicine in 1977. Sheila first went to work as a Research Surgeon at CSU. There, her job included placing experimental catheters in calves to monitor and assist with blood flow. In 1979, she accepted a job at the National Wildlife Health Lab of Madison, Wisconsin where she studied Bald and Golden eagles. For the next three years, Sheila performed necropsies on dead eagles to determine how these endangered animals had died (or were killed). Eventually though, like many other wildlife groups at that time, the lab lost their government funding and the research was slowed down temporarily. Following more than a decade of study and research, Sheila decided this was a good time to take a break and do something more adventurous, so she joined the Peace Corps. In 1982, Sheila arrived in Belize City, at a time when the British were preparing to leave the newly independent nation. She immediately went to work for the Government of Belize teaching laboratory technician courses and working at the government veterinary clinic. Sheila recalled, "The city was fun then. You could walk anywhere at any time and feel safe." At that time, Orange Walk and Cayo Districts had veterinary services, so Sheila was sent to Corozal to be the government veterinarian for that district. This is where she fell in love with the people and the animals of Belize. So much so, that when her three-year stay in the Peace Corp was over in 1985, Sheila returned to Belize to open her own private veterinary practice in Corozal and has remained since that time. Sheila first discovered the island of Ambergris Caye approximately 15 years ago at the request of the Krueger family, the original owners of El Pescador fishing resort. From caring for their animals, her reputation grew and she was asked to return to do spay and neuter clinics to sterilize the growing number of pets living on the island. From that time on, she continued to perform this service, three or four times a year in San Pedro as well as Caye Caulker. Last October, Sheila accepted an offer from the Saga Humane Society to conduct a weekly veterinary clinic on the island after their resident veterinarian returned to England. She now offers her services every Friday so that the Society can maintain health care for the island's growing animal population. The doctor commented, "I enjoy my trips out to the island and working with Saga's volunteers because of their commitment to providing a service for the island's animals." When she's not working for herself or on the cayes, Sheila also volunteers her time twice a month to the Belize Zoo. She explained this began from an association with Richard Foster, a wildlife film producer who hired her to oversee the healthcare of several captive animals he used in his productions back in the early 80s. "He used these animals to film scenes for documentaries about Belize such as ëPath of the Rain Gods' and several other pieces. Eventually, production came to an end and the film company didn't want to pay for the upkeep of these wild animals so the caretaker, (Sharon Matola), was instructed to destroy (kill) them." Sheila added that since the remaining British soldiers in Belize often visited the animals, Matola stepped in and decided to begin charging a fee for this privilege, in order to finance the cost of feeding them. After receiving a donation of land to house the animals as well, the Belize Zoo was born. Dr. Sheila stated her most outstanding achievement so far, came from removing a cancerous kidney from one of the jaguars at the zoo. "Many of the zoo animals are elderly now and have a variety of health problems related to their age. It is very rewarding to care for them." She also vaccinates, tends to injuries, and oversees the rehabilitation of the zoo's "residents." In her spare time, Sheila does not relax in front of the TV, but chooses to read science fiction or do handicrafts. She is quite fond of crocheting, knitting and tatting - an almost "lost art" from which she produces very intricate, detailed lace-type doilies or other decorative pieces. When asked about her future in Belize, Dr. Schmeling stated, "I'll stay as long as I'm working. I love the critters here." The country of Belize is indeed blessed with the many volunteers who come to help in one way or another, and even more so from the ones who return to continue their mission. As well, the island of Ambergris Caye is very fortunate to have the services of a qualified veterinarian who will travel across the bay every week to help care for their pets. 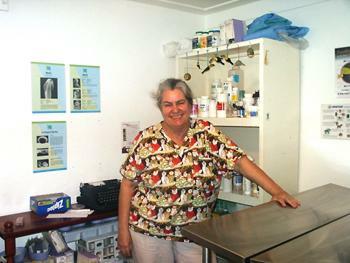 On behalf of the residents of San Pedro and the many animals she cares for, we thank Dr. Sheila Schmeling for her generosity and for traveling every week to provide a much-needed service in "Our Community". Is there any chance that the Schmeling I�m here writing to is a relative of Karl and Emmi Schmeling (born Marburg, in Brno, Czechoslovakia, in December, 24th, 1910)? Are there many Vetenarian hospitals in Belize?